The US is ramping up pressure to secure a Trans-Pacific Trade Deal with conditions that could undermine the national interests of nations involved. WikiLeaks documents say talks are “paralyzed,” with the US refusing to compromise on disputed issues. 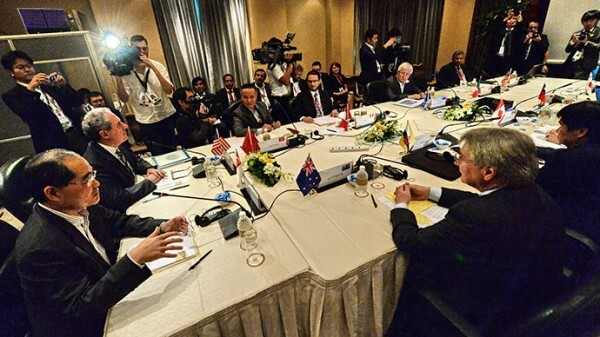 Anti-secrecy group WikiLeaks has released two documents revealing the state of negotiations for the Trans-Pacific Partnership (TPP). The deal in question includes 12 countries – the United States, Japan, Mexico, Canada, Australia, Malaysia, Chile, Singapore, Peru, Vietnam, New Zealand and Brunei – which represent more than 40 percent of the world’s gross domestic product. “I’ve already mentioned the parts we can’t budge on, so the issue is what both sides can do based on that,”Nishimura said. Details of the deal had been hidden from the public eye until last month when WikiLeaks divulged a trove of information describing the ins and outs of the agreement. Washington has been criticized for not revealing the details of the agreement. WikiLeaks’ files show that there is significant disagreement over 119 outstanding issues, with the US refusing to compromise on a number of contentious issues. It is not clear from which of the 12 countries participating in the talks the leaks came. The deal has been hailed by Washington as a “number one priority” that will boost the economies of all the participating countries. But some of the conditions have sparked criticism that the nations involved in the deal may see their interests undermined. Among the issues blocking the agreement stipulates new powers for multinationals that would allow them to challenge country laws in privately run international courts. Washington has endorsed such powers in previous trade deals such as the North American Free Trade Agreement (NAFTA), but conditions in the TPP could grant multinational more powers to challenge a wider range of laws. Under NAFTA several companies including Dow Chemicals and Exxon Mobil have sought to overrule regulations on fracking, oil drilling and drug patents. “The United States, as in previous rounds, has shown no flexibility on its proposal, being one of the most significant barriers to closing the chapter,” said a memo from one of the participating countries obtained by the Huffington Post. Furthermore, among the rumored conditions in the treaty are new standards that would grant pharmaceutical companies new intellectual property rights. The regulations would extend patents, giving companies monopolies on new medications and potentially pushing up prices in the developing countries participating in the deal. Rights groups have also voiced their opposition to the treaty and slammed reforms that they say would limit freedoms on the web. Organization Open Media have launched a petition against the TPP’s“extreme online censorship” and have already collected over 100,000 signatures.